Adorable for the 4th of July! 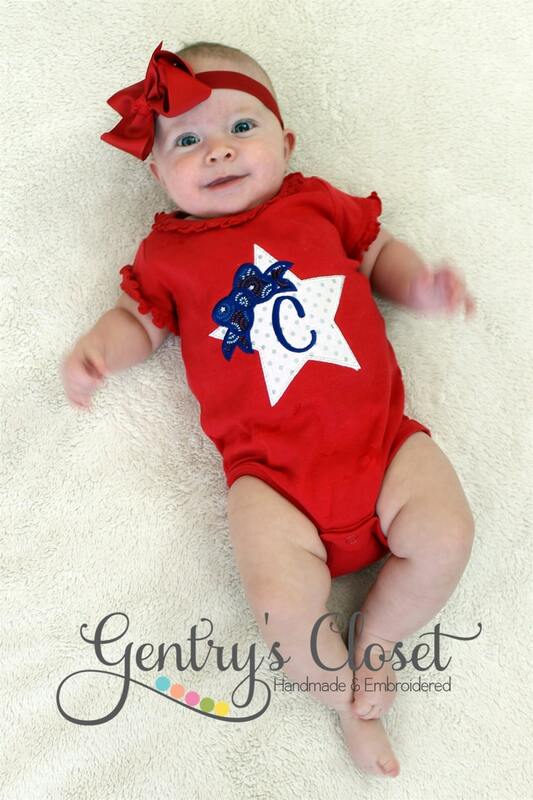 A patriotic, red, ruffle infant bodysuit with a large white star with silver polka dots, a fireworks appliqued bow and a single letter monogram. *This listing is for the infant bodysuit only. Red headband and matching red dress are available in our shop! Monogrammed Bunny Ears Shirt or Infant Bodysuit for newborn, baby girl, toddler, child. Personalized Easter children's boutique clothing. Easter Cross shirt with monogram. Floral Christian cross on girl's shirt. Religious outfit. Baby girl, little girl, toddler. Easter outfit.